EPI folks wrote a paper titled “Broad-Based Wage Growth Is a Key Tool in the Fight Against Poverty.” I wrote a response titled “If You Want Really Low Poverty, Market Income Is Not Going To Get You There.” In my piece, I point out that 2 in 3 poor people are either children, elderly, disabled, or students and therefore are not available for more work and, of the remaining third, a sizable chunk (8 percentage points) are people who do not work because they are caretakers and thus may also not realistically be available for work. Today, EPI has furthered the dialogue one step further with a post titled “Strong Wage Growth Would Complement the Safety Net in Reducing Poverty.” As with the first post, I do not quibble with the idea that increasing market incomes (through higher hourly wages or otherwise) will reduce poverty. 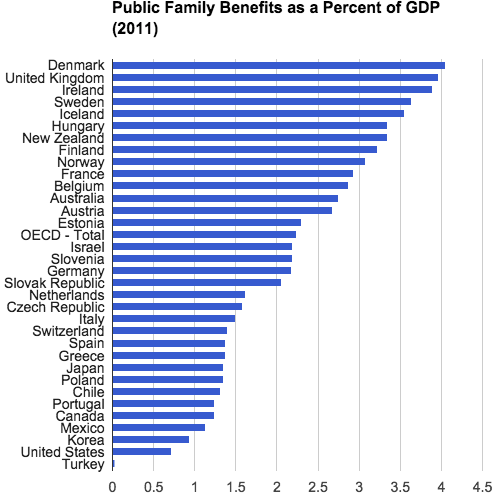 What I do quibble with is whether the magnitude of the anti-poverty effect is that impressive relative to what welfare programs typical elsewhere in the world could do. In the EPI post, the authors focus primarily on child poverty. The point of this focus is to say that market income boosts for the few impoverished who can realistically expect to get them will have spillover effects for the non-working poor that live in the same households. This is true for all non-working poor — a disabled non-working person that lives with a low-wage worker will benefit if wages go up — but in the greatest degree for the non-working child poor. Children might make up a disproportionate share of those in poverty, but they also make up a disproportionate share of those lifted out of poverty by stronger wage policies. Children make up 23.1 percent of those in market-based poverty (16.8 million out of 72.6 million). By growing wages with productivity and simulating a full employment economy, they would make up 36.6 percent of those pulled out of poverty (4.4 million out of 12.0 million). 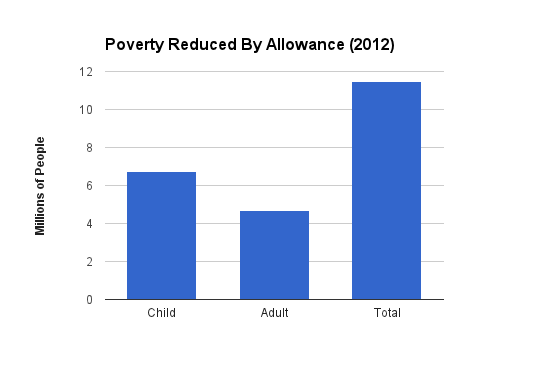 This represents a 26.1 percent reduction in child poverty. The entire tax-and-transfer system, meanwhile, represents a 37.8 percent reduction in child poverty, leading us to feel that our market income approaches are nothing to sneeze at. So, under the wage simulation, there is a 26.1 percent reduction in child poverty. This is contrasted against status quo transfers, which on the same type of measure reduce child poverty by 37.8 percent. The transfer percent is still a considerably larger number than the wage percent, but since they are close-ish, that’s supposed to suggest that the wage number is at least somewhat impressive. To be sure, we have other transfer programs that reach kids, and some like food stamps that even take the number of kids in the household into account when defining benefit levels. But this is also true of these other countries. The General Housing Allowance in Finland, for example, pays out housing benefits based upon how many kids you have, though this is scored as a housing benefit not a family benefit. In any case, the point here is that transfer incomes in the US are not actually doing a lot to reduce child poverty, relative to elsewhere in the world. Thus saying that your wage simulation would cut child poverty by a similar (but actually still considerably lower) amount as our current weak transfer system is not actually that impressive. Also, it’s important to note that spillovers go in both directions. Upping market incomes will of course improve the lives of those adjacent to those who get them. But, similarly, upping transfer incomes will improve the lives of those adjacent to those who get them. A child allowance of $300 per month per year would, under a very simple simulation, cut official child poverty by 6.8 million people, but also spill over (in a sense, obviously the parent receives the check) to cut official adult poverty by 4.7 million people. Ultimately, everyone in this discussion is supportive of both income channels here and so there is not much of an argument going on. You can increase market and transfer income at the bottom and you should want to do both. With that said, I really do believe that there are severe limits on how far market income can get you and I think it is important to emphasize that capitalist markets are inherently and unsalvageably defective in this regard. This should be the Left’s standard position — poverty in rich countries is primarily due to structural problems in capitalism — and I fear that too much talking about jobs, wages, education, and so on sometimes leads people in the wrong diagnostic and consequently prescriptive direction. Previous Previous post: Does brand differentiation lower prices?